Today's Draw: Two of Swords from the Victorian Romantic. Do you believe one presidential candidate is whacked out and the other is reasonable? Do you find yourself using the word "evil" to describe people in your life? What can BJ and Fifty Shades of Gray tell you about how to be in this world? Day Four of the One Card Challenge and I'm rarin' to go! Since part of my intent for this week was to teach a little about different ways you can read cards, I'm going to do some teachy teachy stuff today, too. One of the ways I teach card meanings is to teach all the twos at once, for example. It actually works. There are common lines you can draw and keywords you can reference through each number of the minor arcana which can make remembering card meanings a little easier. And each number 1-10 of the minor arcana (the "pips" as we call them in tarot) corresponds to two, sometimes three major arcana cards. These cards also embody the same basic keywords. The majors that correspond to the number 2 are the High Priestess (major arcana 2), Justice (major arcana 11) and Judgment (major arcana 20). The reason these are all twos is because if you reduce their numerical assignations to a single digit, you get two. For example, Justice is card 11 and 1+1=2. So yesterday we talked about balance and choice being keywords for the twos. 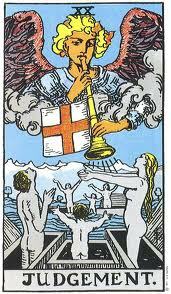 That is clearly seen in the Justice card with the scales of justice and fair reasoning. And it can be seen in Judgment, because the angel is calling your soul to judgment so a choice can be made based on your past experiences. Those are simplistic definitions of those cards, but they work. 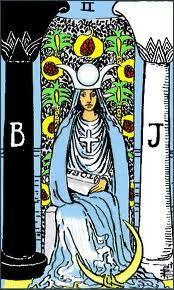 But now to the mother of all twos, the High Priestess. For me, she demonstrates another aspect of the twos...dualism. She is positioned between the dark and light pillars of Solomon's temple, Boaz and Jachin (bet you thought the BJ stood for something else, huh?). All this points to balance. 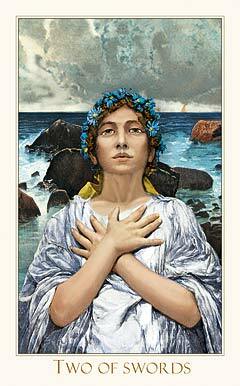 And the High Priestess is the embodiment of the intuitive powers we discussed in yesterday's card. But, to me it also says she stands in that place between black and white. Which is the meaning I want to address in today's entry. In both of the Two of Swords cards you've seen, the woman's head is centered between two equal and opposing things...the hands on the Victorian Romantic version and the Swords on the Rider Waite Smith. Somewhere in that intersection between the two extremes is where truth lies. 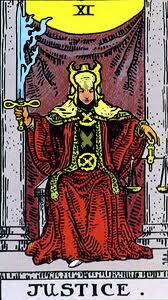 All three of the major arcana cards I've discussed today are focused around truth in different ways...the practical facts of Justice, the spiritual truths of judgement and the intuitive truths of the High Priestess. What all these cards are telling us is that truth lies within shades of gray (cue the jokes about 50 Shades of Gray). You see it all the time. Someone is surly and antisocial. So they're a monster, a psychopath, evil incarnate. Or a restaurant has really good pasta, so you've got to go there, everything on the menu is fabulous! We tend to place judgments on people, situations and things based on black and white views of the world. The truth is rarely black or white. The surly person might give of themselves in other ways. And the restaurant might have a really bad cheesesteak. I would like to say "nothing is all good or all bad", but even that statement is an absolute! Though I sometimes find myself placing people at things at extremes, it's a bit of a pet peeve of mine. I really don't like the way we demonize some people and deify others. We not only do them a disservice, but we do ourselves one, too. Because we never see the truth. More importantly, though, we put greater distance between ourselves and our god. A couple of days ago the US commemorated the day when "the evil doers came and attacked our innocent country." That is how many Americans feel. But the thing is, every interaction and every drama we have with someone else reflects something back on us. And when we demonize our opposition and deify ourselves, we hold that reflection away from us, as though it has nothing to do with us. Denied in all the violence of that day was a message about the way we're seen in the world. Certainly it was an extreme message and an extreme expression. And I, in no way, excuse what they did or accuse the victims. This isn't about that. It's about how, when we demonize others, we miss the reflection. We say, "that is not me, I am good, they are bad, I am reasonable, they're fanatics." The truth is America's not all good. Some of the things the terrorists had to say about our ego focused, money driven society were true. A few blocks away and a few years later, another unfriendly plot was being hatched against our citizens by Wall Street. We may have been taken by surprise by the crash of our economy, but do you think the jihadists were? Of course not. They've been trying to tell us who we are for years. But we didn't listen. Because they're crazy evil doers and we're doers of good. Just ask all the families we've given mosquito nets to in third world countries. When we say, "all those criticisms are outside of me, they have nothing to do with me, I have no control over their opinions"—when we refuse to listen and see what's being reflected back—we keep the door open for more aggression to happen. When we demonize our detractors, we, in that one simple act, absolve ourselves of responsibility in the dynamic. If god is everywhere and everything, we can't disconnect from others by placing them separate from us. They're not. We are all part of, and a product of, god. We are all of the same stuff, just in slightly different shades of gray with no pure black or white among us. I don't mean this to be about 9/11 or good and evil, but more to illustrate what we do when we ignore shades of gray. Those men who flew into the towers had families that they loved. They were doing this as part of a holy war in their minds. They were doing this out of devotion to their beliefs.We can debate all day about how screwed up that is, just as we can debate how screwed up America was to enslave men and women based on our beliefs. The fact remains, they were not all bad. And we're not all good. Black and white are only reference points to enable all the gray in between. So, in all my story above, we see how the Two of Swords can indicate a mind split into dualistic thinking and show us that our head should rest somewhere in the area between. We can see how the truth lies between those extremes and the role intuition and divine fairness play throughout the twos. And we can also see how black and white thinking is another way of holding others and our god at arm's length. If we're going to evolve and if we're ever going to change the way this crappy world operates, we need to ditch the dualistic thinking that holds our growth at bay and begin to understand ourselves and others in a more divinely intimate way. Beautifully said. I've been working on a book that follows one person from lifetime to lifetime, through grief, despair, hope, love, and the one thing that stays constant is that there is always change, and nothing is totally as it seems. No black and white, many many shades of grey and every color in between. It's all within us, and shows up sometimes in surprising ways. Thanks for your beautiful insights. Thanks for your comment. Your book sounds really interesting. Good luck with it!